New Balance Releases The 990v5 | RESPECT. Boston-based New Balance Athletics, Inc. announces the release of the New Balance 990v5. This iconic style, originally released in 1982, represents the best quality, craftsmanship and performance that New Balance has to offer in the MADE range. The updated iteration maintains similar aspects of its predecessor, though more refined in construction and design. The New Balance 990v5 offers a new classic for 990 series fans and sneaker connoisseurs with modernized aesthetics and a clean, shortened design for an understated contemporary silhouette. The new model maintains the essence of the 990v4 while offering new elements including a TPU power strap, new Ortholite insert, and modernized badging included on the tongue and foxing. The upper offers premium pig suede and mesh with 360 reflective accents and an engineered graphic tongue design with a lace keeper. The New Balance 990 has been iconic for 3 decades and maintains its cultural relevance on the street and in fashion. Tech innovators, celebrity A-listers, social influencers and sneaker connoisseurs wear it. Some say, “it’s just a grey shoe,” but there is so much more to it than that. Released in 1982, the New Balance 990 made waves as the first $100 athletic shoe and debuted as the most enduring technical running series on the market. With an upper made of pigskin and mesh, the shoe incorporated a motion control device, and a patented ENCAP for cushioning. Updated iterations of the 990launched in 1998, 2012, 2016, and now 2019. 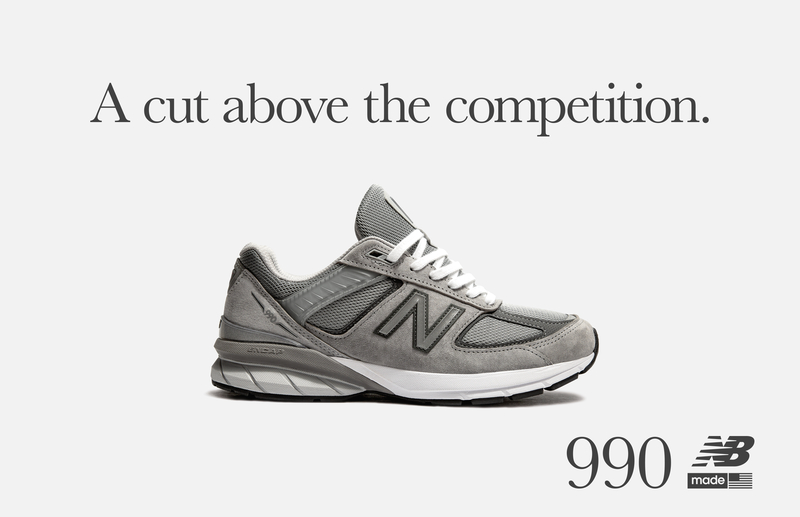 The New Balance 990v5 will release in North America beginning April 6 and globally May 4. The new model will retail for $174.95 and be offered in grey, navy and black in width sizing. To celebrate the release of the New Balance 990v5, the style will be added to NB1 – the New Balance customization platform and be offered in an array of suede and mesh colorways for consumers to design one-of-one silhouettes. The NB1 990v5 will launch on June 14 on www.newbalance.com/nb1.